I went to the Concours d’Elegance of America car show this past weekend. The event used to be known as the Meadowbrook Concours and was held at Meadowbrook Hall in Rochester Hills, Michigan, but for a variety of reasons the show had to move to a new location. This year the event was held at St. Johns near Plymouth, Michigan. I believe the show had over 300 cars of various vintages and styles. My favorites tend to be the cars of the 30’s but there are interesting aspects to most cars displayed at this event. 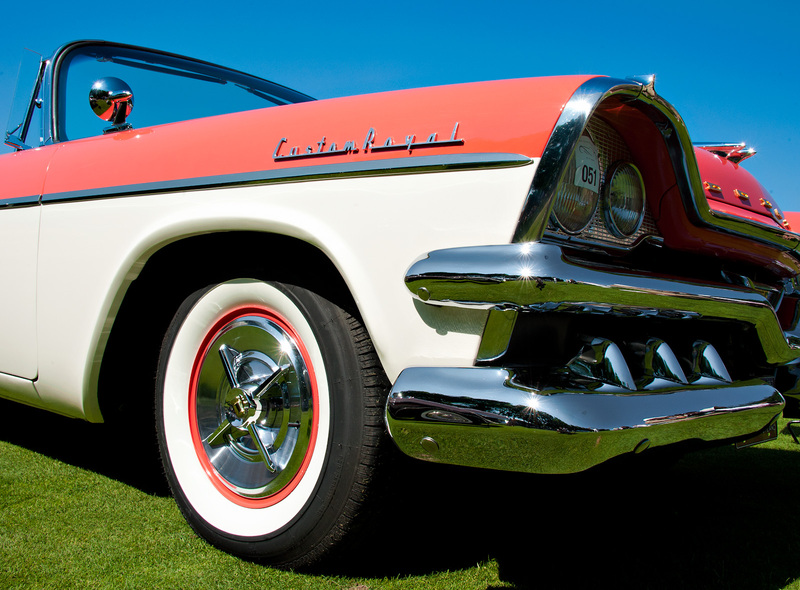 This particular shot is of a 1957 Dodge Custom Royal Lancer. This car had just completed a full restoration and was refinished in the original colors of ‘Tropical Coral and Glacier White’. No special processing was done on this image apart from some sharpening and the cloning out of two small pieces of grass on the tire. Are those fins just above the headlights? I love that even the rims are painted to match the body paint. I sure hope you post up some 1930s goodness! I want one… Really nice shot.